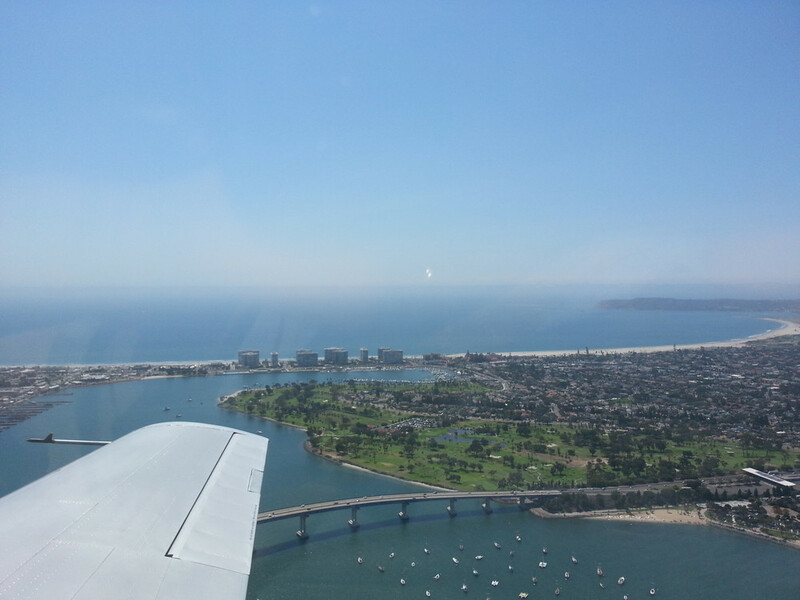 How would you like to fly the quintessential World War II Warbird down the beautiful San Diego coast? Give the gift of flight to a loved one. Air Group One's beautiful SNJ-5 is available for Warbird Rides to thrill those you know who love the sound and feel of old WWII radial engines! You can fly in Air Group One's beautifully restored and maintained SNJ-5 “Sassy” in the skies over the most scenic areas of San Diego. In addition to being a memorable adventure for you, a memorable ride in “Sassy” makes a great gift of flight for a husband, wife, father, or other loved one in your life. Gift Certificates are available! 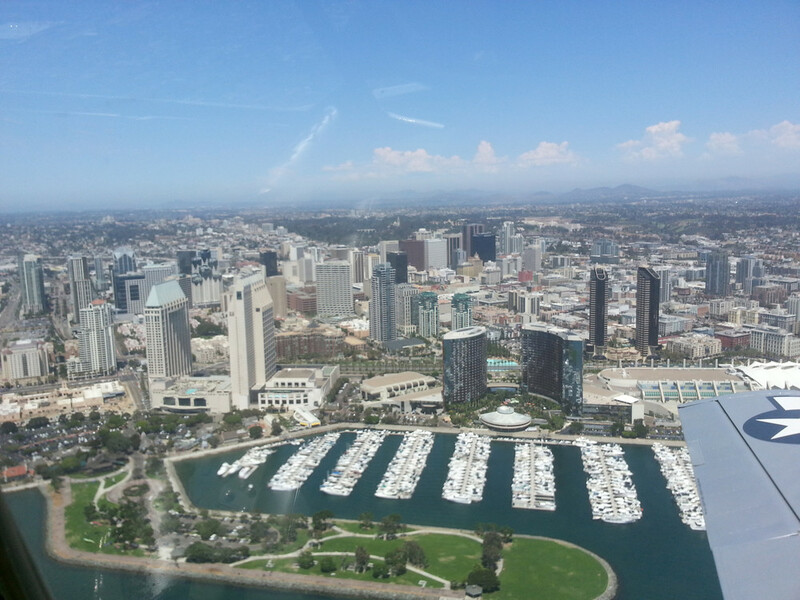 Bring a camera and capture memorable photo opportunities of San Diego! Air Group One is a 501(c)(3) non-profit organization. All donations are 100% tax deductible. a pilot that wants something unique and exceptional. a Gift certificate that a person can use at their best opportunity. Someone that wants a tax write-off opportunity that is exciting! To Fly a Warbird at FlyDays! Choose the Around the Patch Ride!! Midway ID will be required at time of ride. "Sassy" SNJ-5 rides are for one person, who sits in the cockpit behind the pilot. The flight time is from take-off to touchdown and can vary depending on flight package chosen and weather conditions. My dad had the best lifetime experience imaginable! Thank you for allowing all of us to participate - he loved it and Alton is a wonderful and patient man - my dad felt free and a live! I downloaded the edited video. Thank you guys SO much! You all did such an amazingly professional job throughout the entire process. The video looks fantastic. The experience has been unforgettable (even more unforgettable with the video). Your video editor did a really stellar job and managed to piece together the best moments of the flight. This was the flight of a lifetime - something that I’ll never forget. I’ll always appreciate the opportunity that your team gave me on my 50th birthday. I wish you all the greatest success at keeping these kinds of classic airplanes in such a wonderful running condition. All Passengers must sign a Hold Harmless form prior to the flight. Do you feel the need to experience some G's? ... G-Force that is. Fly WWII combat maneuvers in the eastern hills over beautiful San Diego. Do you have what it takes? Air Group One Special Events only - Reserve your seat in advance now! A quick hop around historic Gillespie Field. Great for kids and the young at heart alike! Around the Patch Special Event (FlyDays or other) Reserve Now! 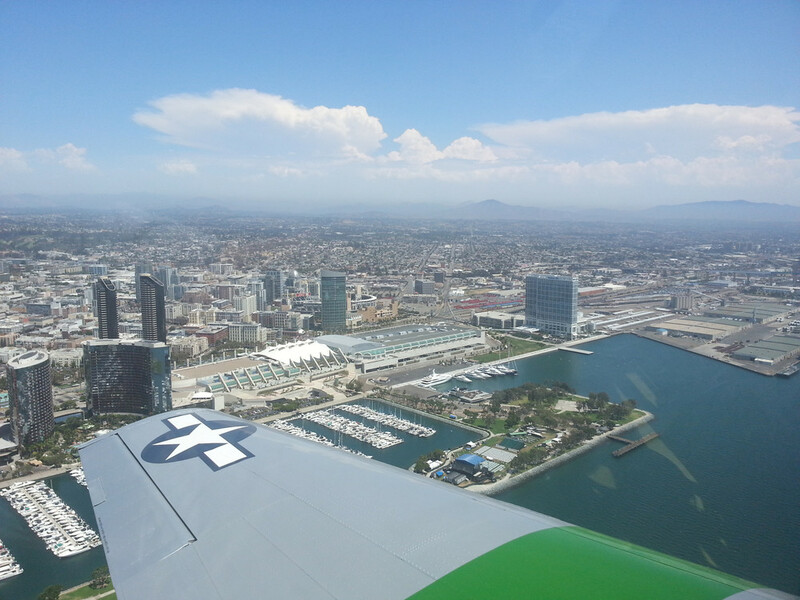 American history and breathtaking San Diego views with a side of adrenaline - That's what you get with the "Fly a Warbird" tour from Air Group One in San Diego. 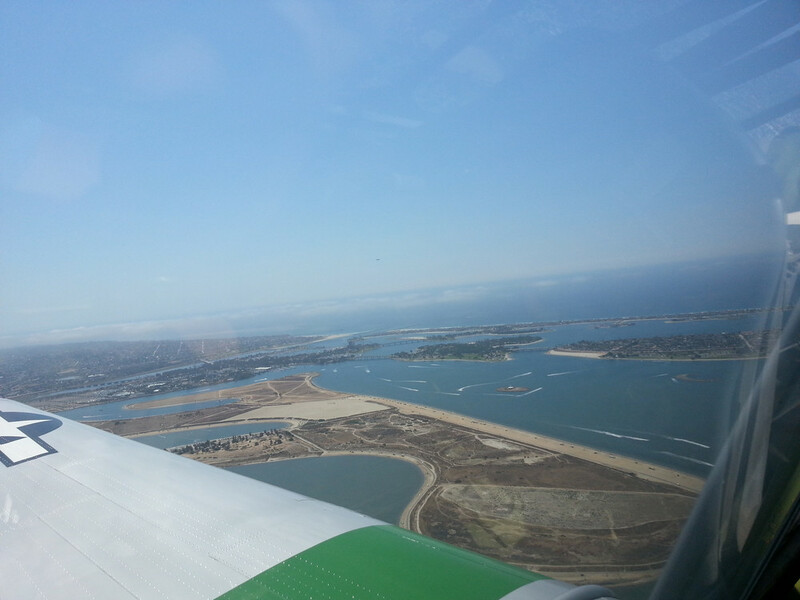 And, you can feel good about spending a little money on this awesome San Diego flight because all proceeds go to charity! I was lucky enough to experience flying in the beautiful SNJ-5 WWII Warbird named "Sassy" and it was something I'll never forget.